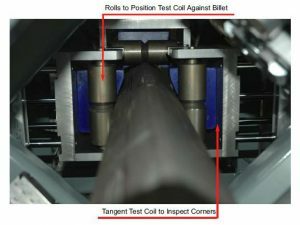 MAC can offer Phased Array technology to allow simple testing of both round corner square billets and large round billets. MAC has a unique Phased Array cassette system that allows quick change between the two major geometries (round or square). The transducer assemblies follow the product surface and allow the testing to be optimized relative to the bar center. MAC can supply a combined Eddy Current and Ultrasonic system for inspecting hot rolled square and round billets up to 9” (228.6mm) in diameter. 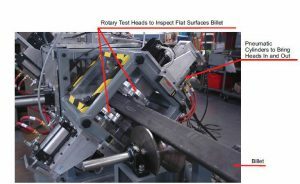 The 8-channel eddy current test uses both sector and rotary test probes to spot defects on the flat surfaces and corners. Square or round corner billets can be tested. The UT system can be Phased Array or conventional array type testing. The UT method detects internal defects and makes it possible to volumetrically inspect large bar product. These tests meet MIL STD 2154 standards. Detects longitudinal defects in the flat surfaces, detects transverse and longitudinal flaws on the corners. MultiMac® electronics have eight test channels. Set-up can be accomplished in less than 10 minutes and a size change only requires an adjustment of the headplate probes. The MultiMac® electronics used in the billet test system have a full Windows® based user interface, making it easy and intuitive to operate. 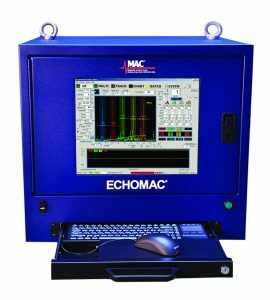 Echomac®FD6 UT test electronics with 48 channels are expandable to 64 channels. Mechanical operation consists of four transducer test heads, each with three surface ride shoes containing three or four transducers, and one bubbler for coupling purposes. 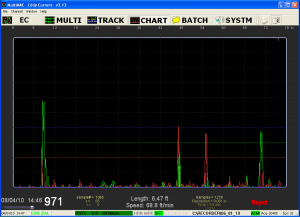 A tracking and marking system is available to identify indications. Features an offline calibration station and an integrated water circulating and cooling system.